One of the challenges before launching your game is finding people who are willing to test it and offer you useful feedback on it. Getting friends and family to check it out is certainly useful but isn’t always enough. Understanding your user and ensuring that the user experience is as good as it can be before releasing your game into the market, is a hugely important part of the process. As a game music composer, I’m not really able to offer much advice on how to develop your game but from my experiences in working with many amazingly talented indie game developers (see my credit list), I know that one area which is often tricky, is in knowing where to source those beta testers. So, I’ve had a go at compiling a list of places that could be useful to be aware of and to check out. Alphabetagamer is ‘the worlds biggest beta testing site’. They cover alpha and betas on all platforms and do so for free, however they will only play your game if it’s free or if you give them some keys to distribute and offer through their website. They aim to add new games to their website each day. IndieQA was created in 2015 by a group of playtesters wanting to support Indie developers with their games. They offer a free service to beta test games as long as you provide keys for your game for your preferred platform. Beta Family has over 65,000 testers that you can invite to test your game and target based on demographics and device. They have an easy to use test builder and 3 different price plans (from free to $399/month) for you to choose from. PreApps is a site that helps people to discover and test new apps before they are released. They cover apps on both iOS and Android and offer various services to help with the launch and promotion of your mobile app. This includes submitting your app to over 150 sites for review. UberTesting provides access to real users to test and offer feedback on apps, websites and more. For mobile game developers it can be a great way to get feedback on your game. You don’t need to integrate SDK, you can target specific user segments, set up surveys, interviews, focus groups and more. Betalist is a place to discover and showcase new startups. It’s a community of creators and early adopters. If your mobile app or game offers something exciting for early adopters to get their teeth into then check it out. PlaytestCloud offers a one-stop solution for playtesting mobile and browser games during all key stages of game development cycle i.e. prototyping, development, soft launch and after release. You can easily set up a playtest, specify your target audience and then watch and listen to videos of people playing your game. There are 4 different products and various prices associated with the kind of survey or test you’re looking to implement. Prices range from $9 per response right up to over $1000 for longer studies. Roastmygame is a site which encourages indie game developers to post their games so that they can gather ‘sugarfree’ feedback on it. Anyone can post a game and anyone can offer feedback. As an indie game developer or indie filmmaker, one of the toughest challenges in your creative journey is staying motivated through it. If you’re working alone or even in a small team, maintaining that energy and enthusiasm through the various stages of your project can be really hard – especially each time you hit a stumbling block, which you inevitably will. What’s driving you to make this game or film? What’s exciting about it and which aspects do you really want to get your teeth into? Know what the reasons are for doing this and jot those down. Keep them close to you as a reminder and motivator. Know the purpose of this whole exercise and experience and think about what you’re hoping to get out of it. What areas do you want to be involved in and which areas aren’t so interesting for you? Often people lose motivation when they’re stuck doing something that they never really wanted to be doing in the first place. Creating a game or film requires lots of skills. You may not have all of these skills and you may or may not want to develop all of these skills. There is nothing wrong with not wanting to learn absolutely everything and in finding others to help with those key areas. Try to make a plan with some goals, milestones, and targets for you to aim for. Break it down into manageable tasks so that it doesn’t feel overwhelming and each time you make a break through – celebrate! There will be many steps along the way and it’s important to know what those steps are, to keep moving forwards and to appreciate how far you’ve come. - Can offer expertise in specific areas e.g. music / sound effects / art etc. I’m a big believer in investing in projects that you really want to work and believe in. This means investing both your time and money into it. If you put some financial investment into it (it doesn't have to be masses by the way - just a little is fine), this means you’ve got some skin in the game and you have to make it work. The amount of investment is completely up to you - but if you invest in the game (in the assets / sound / your team), or your film (the crew / cast / music etc) - you will have that extra drive and need to make your project successful. Failure will not be an option and you will make it happen! Don’t be shy about your game or film. What you’re doing is exciting, brave and challenging. Your friends / colleagues will most likely be really supportive and could be helpful along the way. Another key reason to shout about it – is that often when you tell others that you’re going to do something – by having said it out loud – you will hold yourself accountable to making it happen and staying true to your word. Say that it’s what you are doing, and you will make it so. You may have lots of other ideas – of other games or films that you want to work on, but realistically there is only one of you and you only have so much time. Pick one to prioritise and see it through. If you don't, you will most likely keep getting distracted and finish none of your great ideas - so focus focus focus! Your time is precious, and so use it wisely and make sure that you’re moving your project along whenever you can. Try to get into a routine whereby you dedicate a bit of time to your project every day or week or whatever you decide works for you – and stick to it. It may seem tough initially but if you stick to your routine and also take some time to figure out what routine works best for you - it will become a habit and part of your lifestyle. Completing a project can be really challenging but it’s worth it! Your game or film deserves to be created and for others to be able to see and appreciate what you’ve built and put together. Don’t give up – and if you need some help with music, don’t hesitate to drop me a line! 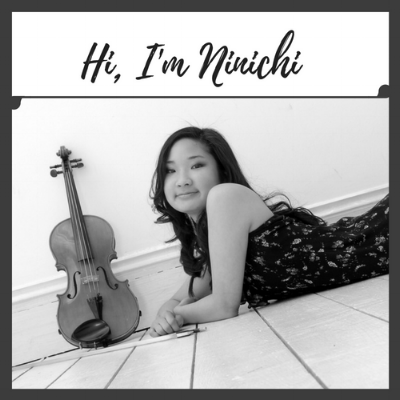 About the author: Ninichi is a music composer for games, films & media. She is the in-house composer for games company Quinton Studios and enjoys working on a range of freelance composing projects. Contact her now to discuss your project and music needs.